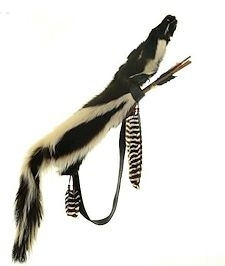 This skunk quiver is made from a full skunk pelt. The fur quiver is lined with a rawhide casing for added durability. It has a flat buckskin back strap, or we can do a shorter strap if you want to hang it from your belt. We can also do this style quiver with other furs. Prices vary depending on the fur pelt you choose. 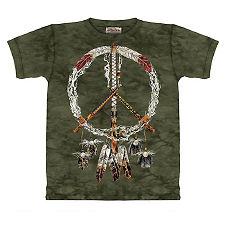 We also have several colors of buckskin to choose from. Bows and arrows are sold separately, but if you order a bow and/or arrows with your quiver, we will give you a reduced price on those items. Select your preferences from the dropdown menus below. The picture shown is representative. This is a one-of-a-kind handmade item, so the one you receive might vary slightly from the one shown. No two skunks are patterned the same. Please allow 2 weeks construction time, in addition to shipping time for delivery of this product. This skunk quiver can be shipped internationally. However, be sure skunk pelts can be imported to your country. This product was added to our catalog on 10/08/2018.